One of our readers recently gave a very insightful comment about being a new JET and feeling overwhelmed by the elementary school lessons she's asked to teach as part of her position. Elementary is definitely a different ball game from the (until recently) more common junior high school and high school ALT placements. Today we'll offer some brief opinions on what makes the elementary environment different and share an example lesson format that struggling new ALTs can try out. In many public elementary schools, lessons with the visiting ALT are ALT-centric. 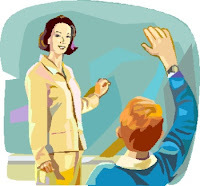 The students' homeroom teacher (HRT) is supposed to be in the room with you, but he or she may not be involved at all in the delivery of the lesson after turning the time over to you. This is in contrast to junior high or high school lessons, in which the Japanese teacher brings you along to class and "calls on you for help" or gives you a portion of the 50-minute class period to do an activity with the students. Accordingly, elementary lessons bestow much more responsibility on the ALT and can require more planning than a junior high lesson in which you're not responsible for all the day's content. It may be a relief to know, however, that when you start up your first few elementary lessons as a new ALT, the HRT may be feeling just as petrified of the class as you. English has only recently been phased in as a required subject in fifth and sixth grade in Japan. Elementary HRTs are supposed to be able to teach every subject to their class of students, from basic science to multiplication to kanji. With this phase-in, though, a completely new subject that they never thought they'd have to deal with before is suddenly being thrown in their lap: English. So, you're not the only adult in the classroom who's feeling uncomfortable. Granted, a confident HRT shouldn't be jizo-ing it in the back of the classroom or dumping everything on the new ALT. They've probably worked with ALTs before and should recognize from their own experience how tough it is to stand in front of a class of 40-odd kids as a fresh college graduate. The best HRTs I worked with were eager to be teaching English and had topics and games in mind that they wanted to cover during class. But not all of my matchups were so lucky. That said, elementary lessons don't have to be so difficult. Think of them as a session of stage acting more than as traditional stand-at-the-blackboard teaching. To the kids your arrival is a rarity in schedule; it's not a normal class to them. They're anticipating something fun and different. But "fun and different" doesn't mean "hard and time consuming to plan." You as you are, a teacher visiting Japan from abroad, is exciting and fun. Those are points in your corner already. First of all, don't forget that we publish lesson plans every Sunday in our Worksheet Sunday series. We have many elementary plans up, with more on the way. For each of my elementary classes, I usually tried to pick one solid topic per lesson with about ten associated vocabulary words. Some of my most successful topics were Body Parts and Animal Noises. Make flashcards for the ten vocabulary words beforehand or rehearse gestures you're going to perform while saying the word. For body parts, my gesture was as simple as pointing to my head while excitedly saying, "head!" For animal noises, my flashcards were as simple and low-tech as printing out images of the animals from Google on A4-size paper and pasting them to cardboard or construction paper. Try MES English for indispensable flashcards if you don't have time to make your own. Once you're in the classroom, use a big smile and a loud voice to say your words and get the kids to repeat. Do a few words at a time, then review ones you've already done, and even after you've "learned" all the words go over them again in random order. I added a gimmick to the review time to keep the kids interested, like showing the cards or repeating the gestures over and over, faster and faster, seeing if the kids can keep up. Seeing the picture or mimicking your gesture while saying the word helps the students internalize the strange new foreign sound. Learning and reviewing the words should take ten or fifteen minutes. (For animal noises, by the way, we had to first learn the names of the animals and then the sounds they make. This also meant I kept the number of cards lower, since each card had two associated pieces of information to learn.) It may seem like a long time, and you may get bored; but if the kids are still having fun then you're doing your job. After you have learned the words, play a game with them. For body parts, Simon Says is a fantastic game. It takes the students a little time to understand the first time through, but after that every class I played it with loved it so much that they didn't want to stop playing. For animal sounds, a game like Fruit Basket is fun. Students are assigned an animal and sit in a circle with one student standing in the middle of the circle. Whoever stands in the middle gives an animal name or its sound, and whenever a student's assigned animal is called, he or she must stand up and run to a different seat in the circle. Whoever is left standing in the center after the chaos is required to give the next animal name or sound. If you keep the pictures posted on the board, students are looking at them and trying to remember the names and sounds of the animals--they're studying. I usually prepared two games when I planned a lesson like this, but depending on the group of kids they may love the first game enough that they don't want to stop. A warm-up, perhaps unrelated game or activity is nice to have as a backup (I kept a CD of "Head, Shoulders, Knees, and Toes" for the body parts lesson and later often used it as a warm up in other lessons), and the last five minutes are good for quickly reviewing the cards or gestures you learned at the beginning of the class. I hope that these suggestions can be helpful for new JETs and other new ALTs who find themselves with elementary students to take care of and a minimal support structure from their HRTs, who are themselves rather new to the world of teaching English. If you have any comments or solid elementary lesson structures of your own to share, we of course welcome your comments below. *I know some things have changed a bit since I taught my last elementary lessons. And different schools of course have different expectations. Your school may be following Eigo Note and insisting you do a certain page of it each class. If at all possible, get them to tell you what page they'll want to cover next time you visit. A lesson topic isn't something anyone wants to find out just ten minutes before the bell rings. I think most topics in Eigo Note can be used in the basic structure I outlined above. And although Eigo Note suggests its own games, songs, and activities, if you plan a game of your own and bring materials for it, I don't think any rational HRT would balk and prevent you from using it, particularly if it's an HRT about whom your main quip is uninvolvement during class time.